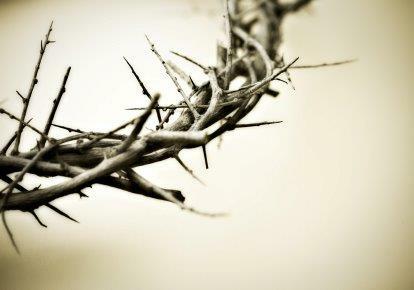 April 5, 2012 by Melinda Viergever Inman, 4 Comments, in God's Love, Why serve Christ? Piercing your brow, a crown of thorns was embedded in your flesh, a cruel and mocking implement of torture. Sweat and blood dripped from your brow—no hand was free to wipe the salty rivulets from your eyes. Stinging. Burning. Sins of the world piled upon you. Tears of anguish. Separation from the Father. The King of heaven laid down his life. Naked. Impaled on wood. Beautiful Savior. As you hung there, did you think of me? Heaving yourself up onto the spikes embedded in your ankles, you battled the suffocating weight and gasped for air. Sagging back onto the nails in your wrists (burning torture), the fought-for air seeped slowly from your lungs. Fresh lacerations chafing against wood with each and every breath, throbbing ache shooting up your arms and legs—the agony was unbearable. Rubbed raw, beaten flesh dragging up and down the wooden beam, did you think—how I love her! She is so worth it! As you struggled for each breath, dragging in the life-prolonging oxygen, did my face flit before your mind’s eye? Did you picture each of my transgressions, one by one? Were you glad you could take them on yourself and remove them from me, poor and undeserving sinner that I am? As your heart struggled to pound out the beats, did it leap with love for me? Did the joy set before you—the elation of forgiving me, gaining me to be your own, having me—give you the strength to endure the anguish of the bloody sacrifice? Hour after hour, you wrestled for life until the ransom price had been paid for our sins. As you redeemed us, did you recall each one of us—when you had planned our individual existence, how you had numbered each of our days before you’d even spoken the universe into existence? What did you think as you hung there? Were your thoughts this intimate about each one of your own? Did you see our faces? Did you picture how your Spirit would draw each of us to come to you, to recognize that you are God, to know that you had died for us, and to believe? Did you foresee how we would come to know that we wanted you, that we had to have you? Did you play out each scenario in your mind, the drawing of each of your beloved? Did the joy and satisfaction of gaining us for all eternity, though costing you your very lifeblood, give you the strength to endure the torment? What did you feel as you hung there? Living fulfillment of Psalm 22 and Isaiah 53. Fully man and fully God. The man-part wanting to escape that cross, to stop the torture, to fight for life, and to live! The God-part loving us so completely and thoroughly that the mere consideration of coming down from that cross was an impossibility! You wouldn’t come down. You are God. God is love. You couldn’t come down. It wasn’t an option. Shocking the watching crowd, you could have called a legion of angels to remove you, to bear you to heaven, showing Satan and the mockers what’s what, saving your skin. But you didn’t—that fact alone proving your deity and winning the day. Any man who is merely a man would have taken the out—crucifixion is the cruelest torture ever devised. But you are God-man, God in the flesh. It wasn’t in your character to forsake the Father’s loving plan to redeem us. To do so would have been unloving. It wasn’t a possibility for you to leave us to pay for our own sins, for all eternity—all eternity! So you hung there. You willingly kept yourself on the cross. Giving it all. Bleeding it out. Taking our sins. Finishing the task. Forsaken. Breathing your last. Yielding your spirit into the Father’s hands. Dead. Side pierced. Coagulated blood flowing. Body cold. Lifeless, bloodless, stiffening. Beloved corpse. John and Mother weeping. Women wailing. Men embracing the battered and empty shell of you. Buried in the tomb. Sealed behind the stone. What an interesting thought! He was obviously thinking of all of us–His bride, the church, but did he think of us individually? Hmmmmm. You portrayed His suffering so well that it takes the breathe away, and I know that He did it for me–for us! Good Friday has come. The day we commerate what He did for us. And, I remember vividly the time I first heard: “He could have called 10,000 angels, but He died alone, for you and me.” Hallelujah! What a Savior! Very poignant thoughts! Thank you for pointing us to thank Him. Oh Melinda, this was heartbreakingly beautiful! Your vivid descriptions made the crucifixion so tangible and real. I could have wept to imagine Jesus’ thoughts as he hung there in agony. Thank you for making this pivotal Bible story come alive for me again. Bless you! Thank you for commenting, Melissa. Each year he brings a new meditation of himself during his Passion. A lifetime of contemplation only gives us a glimmer of the One we’ll soon see face to face.